KeyReia George, shown above, was all smiles when she opened the brand new laptop. The fourth-grader at Frederick Douglas School mused about using the laptop to improve her math skills and become a champion on the Nitro Type Worldwide real-time typing competition. KeyReia’s mentors, Erin Glanker and Sabrina Rabin, are both first-year University of Cincinnati (UC) medical students, who have provided mentorship since October. The youngster was one of about 20 area schoolchildren to receive laptops from UC Med Mentors during an April 2, ceremony in CARE/Crawley Atrium. Med Mentors, a volunteer mentorship effort in the College of Medicine, connects 200 medical students with more than 100 school-age mentees. The organization works closely with the Cincinnati Youth Collaborative (CYC) to train mentors and link them to Cincinnati Public School children for mentorship. 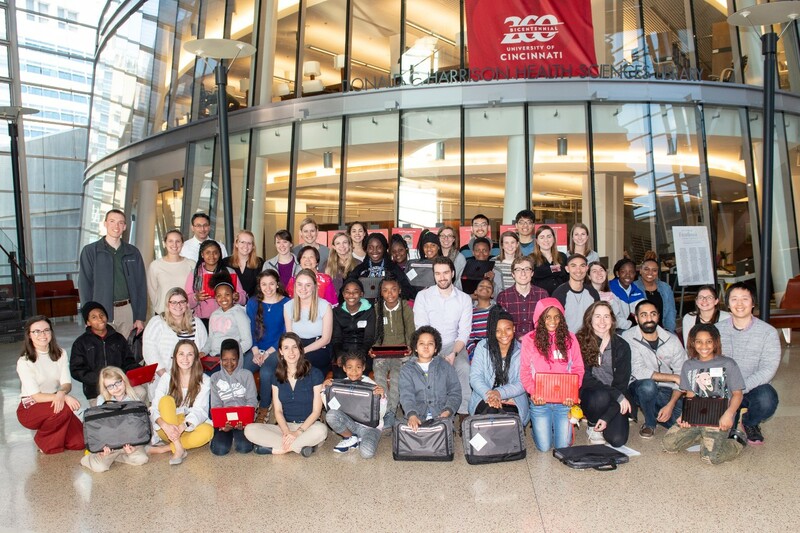 The generous gift of laptops for these schoolchildren is the result of $10,000 in funding from the Clare Family Foundation and medical staff at Cincinnati Children’s, says Charles Cavallo, MD, president of the advisory board for UC Med Mentors and volunteer assistant professor in the UC Department of Pediatrics. “A lot of our medical students have an interest in family medicine and Med Mentors offers a really great opportunity to see firsthand some of the challenging realities families in some of our communities face,” says Keith Stringer, MD, faculty advisor for Med Mentors. volunteer program is made possible in large part by thoughtful, caring parents on the lookout for opportunities for their children. When medical students help by volunteering their time, it becomes a double win by aiding the kids and helping society by preparing and training future physicians for the communities they will serve,” says Stringer, an assistant professor in the UC Department of Pathology and Laboratory Medicine and a Cincinnati Children’s pathologist. Med Mentors and their mentees pose for a group shot in the UC College of Medicine. In order to grasp the mechanisms of disease, physicians often have to first examine the social determinants of health, which can play a role in the diverse ailments seen in patients, explains Stringer. Med Mentors has focused on preparing students for academic success, but mentors also expose students to cultural and extracurricular activities through visits to the museum, the Cincinnati Zoo, arts functions, field trips and sports functions. Sofia Chinchilla and Robert Toy, both second-year medical students, are co-presidents of Med Mentors. UC Med Mentors was founded in 2001 by Wan Lim, PhD, associate professor emeritus of medical education. Mentees come from various schools including several near the College of Medicine, such as North Avondale Montessori School, Clifton Fairview German School, South Avondale School and Rockdale Academy. The mentoring effort at UC targets students in grades three through six, though some students stay with Med Mentors for longer periods. Lim was on hand at the laptop ceremony to congratulate the mentees.